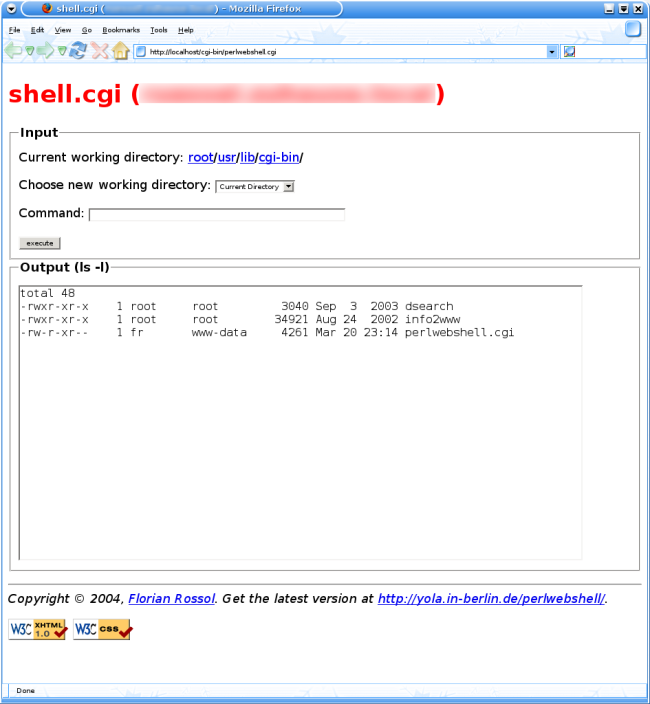 PerlWebShell is based on PhpShell from Martin Geisler. In fact it tries to be nearly the same with one little difference: PerlWebShell uses Perl/CGI instead of PHP (not difficult to guess cause of the name!). Also this Text is based on Martins README. Thanks Martin for releasing PhpShell under the GNU GPL. There are some limitations on what kind of programs you can run. It won't do no good if you start something like Netscape or even vi. All programs have to be strictly command-line programs, and they will have no chance of getting user input after they have been lunched. They probably also have to terminate within some time, depending on the settings of your ISP. You may not be the same user when using PerlWebShell, as you are when you upload your files with ftp. On some systems you will be 'nobody', on other systems you will become 'httpd' or 'www-data'. This is a rather dangerous "feature" of PerlWebShell! So use it at your own risk --- I wont be responsible if your account is closed or something like that happens. 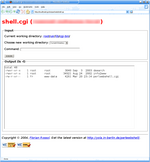 Point your browser to perlwebshell.cgi. The rest should be selfexplaining.